A high-resolution numerical model was performed for a detailed understanding of packed-bed structures constructed by actual scale cokes, and the molten slag (SiO2–CaO–Al2O3) trickle flow characteristics in the lower part of an actual blast furnace. Smoothed particle hydrodynamics (SPH) simulations can track the motion of liquids containing dispersed droplets, and the discrete element method (DEM) with a multisphere approach makes possible to simulate non-spherical solid-particle motion. We carried out high-resolution large-scale trickle flow simulations using more than 10 million particles, carried out case studies of statistical processing, and evaluated the effects of physical properties varied by the composition or temperature of slag samples. We clarified that there is a limitation to predict the holdup accurately based on the capillary number, which is a widely used approach. 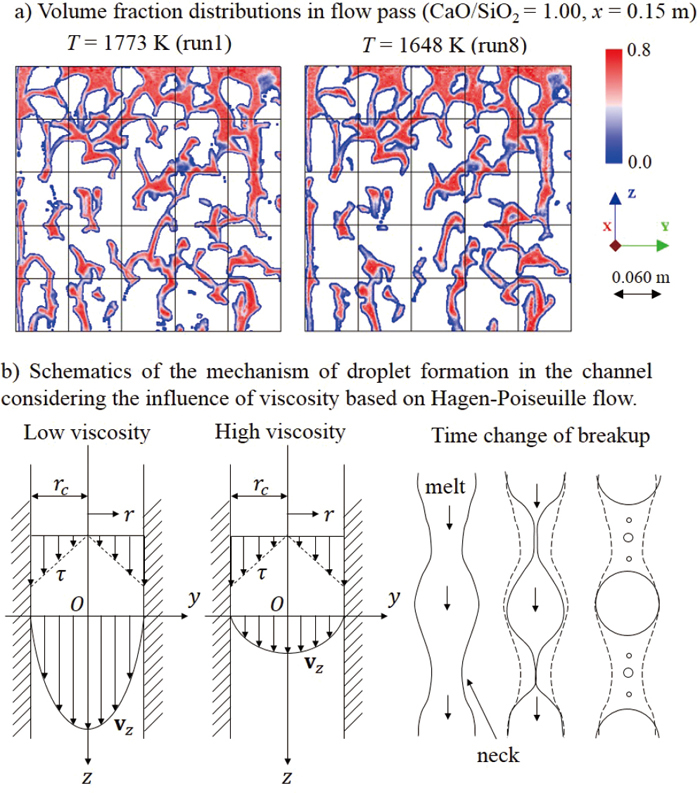 We analyzed the influence of melt viscosity on trickle flow, and clarified that an increase in viscosity increases holdup because limiting the effective flow path and suppressing the dispersion of the droplets promoted the enlargement of each stagnant droplet. This detailed direct dynamic model could explain the mechanism underlying different holdup tendencies in conventional research.